The latest industrial and investment opportunities that Abu Dhabi has to offer will be on showcase at the upcoming sixth chapter of the German Industrial Day (GID) in the UAE capital. The event will be hosted by FCF Fox Corporate Finance (FCF) in cooperation with the Abu Dhabi Department of Economic Development (ADDED), Khalifa Industrial Zone Abu Dhabi (Kizad) and the Deutsche Boerse on April 29 at the Jumeirah Etihad Towers Hotel. 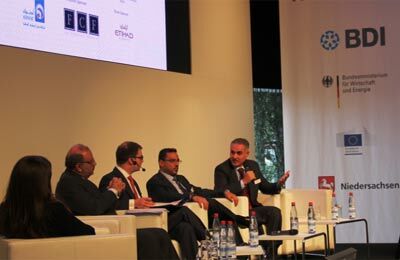 The annual industrial and investment gathering was announced earlier last week on the side lines of the Hannover Messe Exhibition during the UAE Forum. Over the years, the GID has established itself amongst the region’s most prestigious gatherings, connecting C-level executives from Germany’s renowned “Mittelstand” companies (public and private) with regional and UAE investors. Delegates will have the exclusive opportunity to discuss the latest industrial and market trends, experience state-of-the-art technologies and learn about the drivers that shape Europe’s leading economy. They will also explore why many of Europe’s advanced and modern industrial companies are keen on making the move to Abu Dhabi. Kizad’s partnership with the GID is a natural link because of its complete integration with the adjacent Khalifa Port, which together make it one of the UAE’s biggest infrastructure megaprojects to date and is already one of the world’s largest industrial zones. Connected by road, rail, air and sea, Kizad groups major industries as ‘vertically integrated clusters’ which deliver transport and production efficiencies at lower costs through economies of proximity. The German Industry Day is the perfect platform to bridge the gap between Germany and the booming economies of the GCC, the UAE in particular. Several companies have already confirmed their attendance with a serious view to exploring expansion opportunities. German industries, including photovoltaic systems integrators, surface protection services, specialty pharmaceuticals, water treatment technologies, composite carbon production, on-shore seafood production, are among the types of industries attending this year’s GID in Abu Dhabi. The GID 2014 includes a pre-event gathering to introduce German delegates to FCF’s local network of partners and friends and a conference day featuring company presentations and speeches, Q&A sessions, one-on-one meetings and high-level networking opportunities. “This year our visit to Hannover Messe brought updates from existing and new German investors who have decided to take advantage of the unique benefits offered at Kizad. “I am very happy to announce that companies including Muehlhan, Phoenix Solar, UB Composites, Triton Water, Sanochemia Pharmazeutika and others, will be joining us in Abu Dhabi on April 29 to see for themselves what real industrial business opportunities exist in the UAE today. Kizad is an excellent option for European businesses looking to expand into a stable and prosperous area of the Middle East region,” he added. Arno Fuchs, CEO of FCF Fox Corporate Finance, said: “We are delighted to have Kizad supporting us as a strategic partner once again at this year’s event. As an investment bank looking to support business and industrial growth, we are acutely aware of the necessary infrastructure that is often crucial to a company’s success.